Recorded as Hornig, Horning, Hornung, and possibly Hernon and Hernow and others, this is an English or perhaps with some spellings, a Germanic, surname. 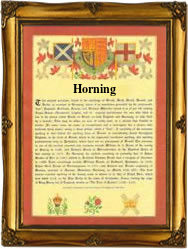 If English it is locational from a place called Horning in the Fen Country, near the city Norwich. The name means 'The people who live at the horn', which may have been a tract of dry land in an otherwise marshy area, or it could mean the bend of a river. In ancient times either could have applied, but the geography of the site has changed so much since the first recording as 'Horningga' in the year 1020 a.d., that it is impossible to say with certainty. If German it is usually spelt Horning or Horninger, it also locational from the town of Horningen, Gerwig Horninger of Kirchberg being recorded in 1324. All locational surnames were usually 'from' names. These were names given to people after they left their original homes to move elsewhere, in search of work. In England many set off for London, and the surname is well recorded there since at least Stuart Times. These recordings include Susanna Horning who married Thomas Pawsey at St Giles Cripplegate, on November 4th 1691, and George Hornung who married Mary Barrett at St Leonards Shoreditch, on May 27th 1770.